6205 2025 Radio Tango Italia. Tango mx. SINPO 33333. 6210 2022 Radio Anouska. "Apache", "Poker Face," jingles. SINPO 34333. 6238L 2334 Over 60 Degree Radio. Blues mx. SINPO 34333. 6242 2345 Sluwe Vos Radio. Music, off few mins later. SINPO 24332. 6255 2009 Radio Merlin Int. Scaffold "Lily the Pink," Louis Armstrong "Wonderful World." SINPO 34333. 6265 2350 Radio Tango Italia. Tango mx. SINPO 44333. 6285 2000 Radio Focus Int. Fleetwood Mac, jingle, Bad Company "Feel Like Making Love." SINPO 34333. 6450 1950 Studio 52. Instr mx. SINPO 44433. 6915 2327 Premier Radio Int. "Papa Was A Rolling Stone," fair peaks. SINPO 24332. 6285 1750 Radio Silverback. Dutch songs. SINPO 54444. 6305 1800 Radio Merlin Int. ID, Rah Band "The Crunch." SINPO 34333. Nice QSL received from Trans Universe Radio - a joint broadcast between Radio Trans Europe and Radio Universe - for their broadcast on Boxing Day. Many thanks. 4026 1710 Laser Hot Hits. Back on the air. "Too Late To Say Goodbye","Goodbye Stranger." Peaking S9+10dB. SINPO 44433. Good to have them back. 5780 1720 Horizon FM Tenerife. Ads, top 40 show. SINPO 34333. 5800 0948 Tower Radio. ID jingle, Dutch song, Bruce Springsteen "The River." SINPO 54444. 6045 1018 Shortwave Rock v Nauen. Captain Beefheart, The Move. SINPO 55544. 6210 1149 Radio Borderhunter. Dutch party music. SINPO 54444. 6255 0930 Radio Merlin Int. Steve Miller Band "Abracadabra." SINPO 34333. 6266 0935 Laser Hot Hits. Relayed by Radio Blackbeard. SINPO 24332. 6275 1656 Radio Tango Italia. Tango mx. SINPO 34333. 6285 0902 Radio Twentana. Dutch song, ID. SINPO 44433. 6285 1730 Radio Tango Italia. Move from 6285. SINPO 34333. 6290 1248 Radio Batavier. "Stars of 45", greeting listeners, strong. SINPO 54444. 6298 1727 Radio Mi Amigo. Greetings, ID, oldies, splash from stations on 6295/6305. SINPO 42432. 6300 1228 Radio Baken 16. "Scatman", jingle, ID, greetings. SINPO 34333. 6305 0956 Radio Telstar. Dutch instr mx, ID. SINPO 54444. 6305 1632 Radio Mustang. Michael Jackson "Thriller." SINPO 54444. 6325 0908 Radio Norton. Dutch songs. SINPO 34333. 6390 1010 Radio Zeewolf. QSO with NMD, Lowland. SINPO 34333. 6391 1617 Radio Lowland/SWCH. German songs, ID. SINPO 44433. 6803 1623 Radio Pink Panther. "Something Cool." Ute QRM. SINPO 53443. 7300 0914 U Boat 66 Radio. Scorpions "Winds of Change." SINPO 44433. 7480 0941 Thunderbird Radio. Bob Dylan "Just Like a Woman," Hot Chocolate, talk in GM. SINPO 44433. 5780 1935 Horizon FM Tenerife. Beats International, ID by DJ, Jocelyn Brown. SINPO 34333. 5800 1525 Tower Radio. Dutch songs. SINPO 54444. 6205 1926 Radio Tango Italia. Tango mx. SINPO 34333. 6255 1326 Radio Merlin Int. Mike & The Mechanics "The Living Years." SINPO 24332. 6264 0918 Radio Experience. "Chocolate Balls," "Chanson D'Amour, "Vogue." SINPO 34333. 6266 1545 Laser Hot Hits. Via Blackbeard relay. Oldies. Weak-fair. SINPO 24332. 6291 0855 Radio Caroline-Rainbow. Dance mx, ID jingles. SINPO 34333. 6300 1456 Radio Etherfreak. ID jingle, blues-type mx. SINPO 34333. 6307 1920 Radio Rainbow. Talk about freedom in Ukraine. Sudden off/fade out 1925. SINPO 44433. 6323 1501 NMD Radio. Country & Dutch inst mx. SINPO 44433. 6325 1915 Bogusman. Robert Plant track, talk about the weather. SINPO 54444. 6375 1332 Flux AM. Oldies, weak signal. SINPO 24332. 6400 1258 Flux AM. Weak, off 1259. SINPO 24332. 6481 1251 Skylab Radio. "Popcorn," greeting Verona, ID. SINPO 34333. 6481 1256 Radio Pluto.QSO Skylab. SINPO 34333. 6481 1309 Radio Rob. QSO Skylab, Pluto. SINPO 44433. 6747 1510 Radio Pioneer. The Beatles "Day in the Life." SINPO 54444. 6803 0908 Radio Pink Panther. Ray Stevens "The Streak," SINPO 44433. 6815 1450 Sundown Radio. Bellamy Bros "Let Your Love Flow," email address. SINPO 44433. 6910 1515 Radio Tidalwave. Depeche Mode, instr tune. SINPO 54444. 14615L 0903 Baltic Sea Radio. "Sweet Caroline", ID announcement, "Caroline" The Fortunes. SINPO 54444. 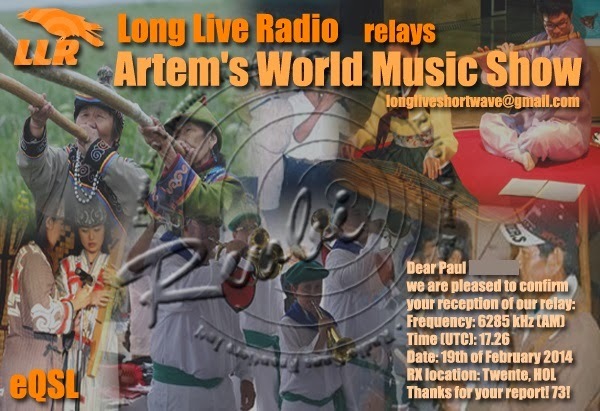 Very nice QSL received from Artem in Moscow for a relay of his world music show, via Long Live Radio. Many thanks. We do not know yet times or dates of these transmissions- It might be only one or two different sessions in the end of February or start of March 2014. We would like to have few hours to be aired but that is absolutely not sure. We shall put our equipment to good warehouse waiting for better times (if there ever are such). 6212 1709 Radio Tina. Greetings, BZN for Dr Tim. SINPO 44433. 6215 1803 Radio Carmen. KLF "Last Train to Transcentral," SINPO 54444. 6240 1734 Radio Tina. Move to avoid QRM from Iran (6205). SINPO 44433. 6265 1658 Radio Casanova. Greetings, "Lonesome Me," ID. SINPO 34333. 6285 1722 Long Live Radio. Tuning signal, ID/email address, Artems World of Music. SINPO 34333. 6303 1711 Radio Telstar. Greetings, Dutch song. SINPO 54444. 6305 1910 Radio MIR. Signal fading out, talking about the protests in Ukraine, music, mention Pirates for Peace. SINPO 34333. 6747 1703 Radio Pioneer. "Let's Get this Party Started," weak SSB QRM. SINPO 54444. The DX world is talking about the appearance of a new station on shortwave - Horizon FM, in Tenerife, Canary Islands. It has been logged on 5780 kHz and reported is using 75W but planning to increase this to 1 kW. On the BDXC Yahoo group Mike Barraclough reports: "Hans Johnson has been in telephone contact with Horizon FM and they insist that the transmission is from north part of Tenerife. They carry Horizon FM from Friday evening until 1000 Sunday and then Atlantis FM till 2200. (Mauno Ritola, Feb 16, Cumbre DX Facebook group)." The station also announces on its English-language website, Twitter and Facebook pages that it is using 102.5/104.5 FM and 5780 kHz. You can see photos from the station on the Maresme DX blog. But some people are asking whether it really is coming from the Canaries or from a pirate station in the UK or Ireland rebroadcasting the internet feed. There's more discussion on Garry Steven's free radio board. Anyway, it all adds to the mystery! 3940 1811 Radio Activity. Music but weak signal, ID through pirate chat. SINPO 24332. 5800.5 1447 Tower Radio. "We Got To Go Down," then Dutch version of "Lying in the Arms of Mary." SINPO 54444. 6205 0910 Radio King SW. Soft rock, occasional ID jingles. SINPO 44433. 6205 1835 Radio Tango Italia. Move from 6285. Tango mx. SINPO 34333. 6210 0902 Radio Experience. "Horse With No Name," "Music and Lights." SINPO 34333. Moved to 6212 at 0912. On 6220 at 0955. SINPO 34333. 6255 1826 Radio Merlin Int. The Jam "Start" then George Harrison "My Sweet Lord." SINPO 44433. 6265 0952 Radio Nora. Short test, oldies. SINPO 44433. 6285 0936 States of Unrest Radio. ID, greeting Dr Tim, "Amadeus." SINPO 44433. 6285 1820 Radio Tango Italia. Tango mx. SINPO 34333. 6290 1602 Delta Radio (W Brabant). "Barbados" then "Motorbiking," ID jingles. SINPO 34333. 6292 1750 Radio Odynn. Dire Straits, ID greetings. SINPO 44433. 6305 1548 1548 Radio Python. American comedy. SINPO 34333. 6481 1556 Skylab & Intersound Radio. ID, "Let Your Hair Hang Down," said closing soon, strong peaks. SINPO 44433. 6940 1535 Trans Europe Radio. Yazoo "Don't Go," Altered Images "Don't Talk About Love." SINPO 44433. 6955 0918 Radio Coax. Oldies, IDs, email address. SINPO 24332. 9510 0928 Radio City v IRRS. Abba "Fernando," Beach Boys, ID. SINPO 55444. 13965U 1618 Over 60 Degree Radio. Blues mx, ID. SINPO 34433. The Come Here To Me blog writes: "Ireland has a long history of pirate radio, something I’ve looked at before in an article for Rabble that can be read here. This brief article looks at a number of political pirate radio stations that operated in Dublin, many of which were operated by the republican movement as a means of spreading propaganda." Nice QSL received from Carmen Radio for reception on Saturday. Many thanks. Today [Feb 10] the FCC released an order upholding a $10,000 fine against Dan Roberts, former manager of Pirate Cat Radio, for unlicensed broadcasting. The fine was originally issued in 2011. Pirate Cat Radio began as an audacious and prominent unlicensed station operating out of a San Francisco cafe, headed up by charismatic leader Dan Roberts who went by the monikers “Monkey” or “Monkey Man.” As the heat from the FCC turned up, Pirate Cat ended actual FM transmission from its cafe studio, becoming an online-only station. However, a third party picked up the Pirate Cat stream and rebroadcast it on the station’s old FM frequency. It was this disassociation between Pirate Cat and the unlicensed FM broadcast that formed the basis for Roberts’ petition for reconsideration of the fine to the FCC. In upholding the fine, the Commission rejected Roberts’ argument, along with his argument that there was no proof linking him to these broadcasts. The FCC’s reasoning for rejecting them, however, brings forward a novel argument that could threaten a common pirate broadcast strategy. 6205 0950 Radio King SW. Rock mx. SINPO 44433. 6220 1337 Tip & Elvis Show. Kinks "You Really Got Me," Cure "Forest." V strong. SINPO 55444. 6236 1442 Radio Rode Adelaar. Trumpet inst tune. SINPO 44433. 6246 1606 Radio Mustang. Bob Dylan, then dance mx. SINPO 54444. 6255 0853 Radio Merlin Int. Queen track, greeting Stuart in Kingston. SINPO 44333. 6265 1705 Radio Casanova. Greetings, ID, Dutch songs. SINPO 54444. 6279 1703 Radio Telstar. OMD, Men At Work. SINPO 54444. 6285 1056 Radio Python. Talk in Dutch, alternative mx. SINPO 44333. 6285 1642 Radio Tango Italia. Tango mx. SINPO 44433. 6295 0920 Radio Altrex. "Lessons in Love," ID, "Boxer Beat." SINPO 34333. 6300 1400 Radio Monique. 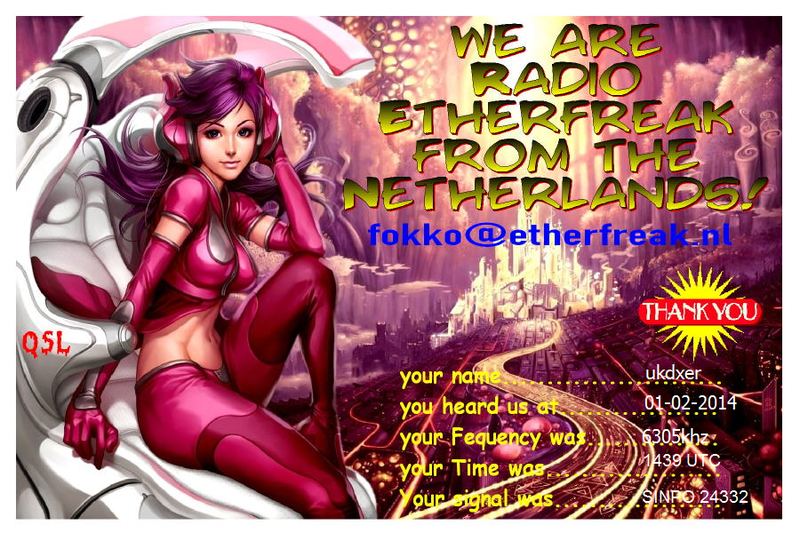 Greeting listeners, talk in Dutch/English, dance mx. SINPO 54444. 6300 1640 Sluwe Vos Radio. QSO, splash from 6295 (Reflections Europe). SINPO 43433. 6305 1030 Radio Etherfreak. Pop. SINPO 44333. 6324 1710 Radio Underground. ID, talk about weather, Chinese mx. SINPO 54444. 6325 1042 Radio Norton. Easy listening, utility QRM. SINPO 43433. 6325 1353 Radio Verona. Dutch songs, ID. SINPO 34333. 6735 1410 Cool AM. Blues rock. SINPO 34333. 6747 1051 Radio Pioneer. Smokie "Living Next Door to Alice." SINPO 44433. 6803 1105 Radio Pink Panther. Simple Minds "Alive and Kicking." SINPO 54444. 6910 0920 Premier Radio Int. "Let's Dance" Chris Montez, ID. SINPO 34333. 6920 1446 Trans Europe Radio. Hot Chocolate "Emma," Harpo "Movie Star." SINPO 54444. 7310 0905 Radio Atlantic 2000 v R700. Pet Shop Boys "West End Girls," SINPO 55444. 7480 0925 Radio Thunderbird. "Stars on 45" Beatles mix, ID, address in German. SINPO 45444. 9480 0907 Radio Atlantic 2000 via MVBR. Pet Shop Boys //7310. SINPO 34333. 12257 0955 Radio WR International. Deep Purple "Black Night." SINPO 44433. 5800 1335 Tower Radio. REO Speedwagon "Keep On Loving You," ID, greetings. SINPO 54444. 6205 0923 Radio King SW. Oldies, occasional ID jingles. SINPO 44433. 6210 1403 Radio Carmen. Michael Jackson "Smooth Criminal," dance mx. SINPO 54444. 6220 1502 Radio Rode Adelaar. Instr mx and off, splash 6225. SINPO 43433. 6240 1740 Radio Tango Italia. Move from 6265. SINPO 44433. 6255 1453 Radio Casanova. Rubettes "Sugar Baby Love," ID. SINPO 54444. 6255 1708 Radio Telstar South. TRex "Hot Love," recording of Caroline from 1974. SINPO 54444. 6275 1650 Radio Black Arrow. "Goldfinger," "Don't Stop," ID, greetings. SINPO 44433. 6285 0927 Radio Night Pirate. Boney M "Ma Baker,", ID, greets, strong peaks. SINPO 44433. 6285 1422 Radio Verona. ID jingle, UB40 "Red Red Wine." SINPO 44433. 6286 1702 Radio Underground. ID, greets, Kraftwerk "Computer Love", splash Bogusman. SINPO 43433. 6295 0916 Radio Altrex. ID, ZZ Top. SINPO 34333. 6295 1602 Bogusman. ELO "One Summer Dream," then Galaxy 500. SINPO 54444. 6305 0905 Radio Verona. ID, greetings, Dutch songs. SINPO 44433. 6305 1427 Radio Rainbow. ZZ Top "Legs," ID, greetings. SINPO 54444. 6310 1713 Radio Mi Amigo. Dutch songs. SINPO 34333. 6320 1725 Radio Pluto. ID, talk in Dutch, Blondie "Union City Blues." SINPO 44433. 6390 1552 Radio Lowland. T'Pau "China in Your Hand," calling Tina. SINPO 44433. 6392 1735 Radio Tina. Schlager and German songs. Strong peaks. SINPO 44433. 6803 0932 Radio Pink Panther. Brotherhood of Man "Angelo." SINPO 54444. 6815 1548 Sundown Radio. "Dragon's Lair," "Do the Hucklebuck," some splash 6803. SINPO 54444. 6950 0858 Radio Coax. ID, polka. SINPO 24332. 7705 1359 Sluwe Vos Radio. "Naked," ID, "You're My Heart." SINPO 55444. 14615L 1411 Baltic Sea Radio. ID jingle, schlager. SINPO 55444. 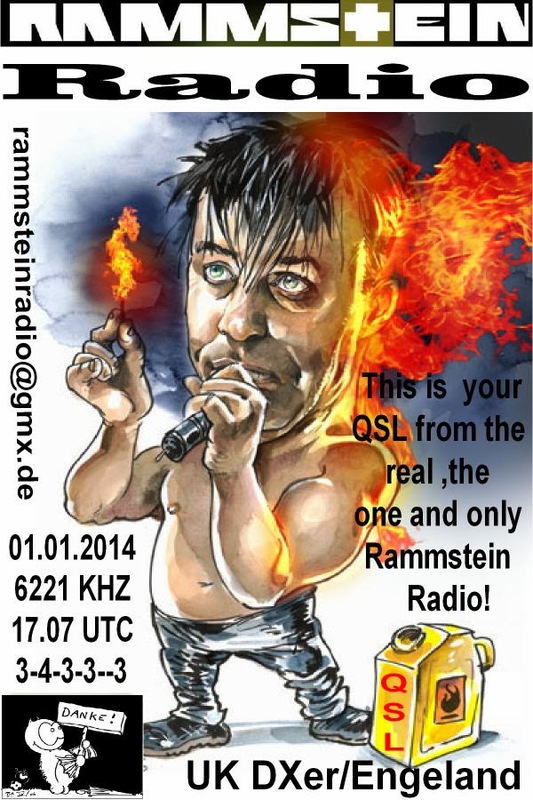 QSL from Germany from Rammstein Radio. Thank you. 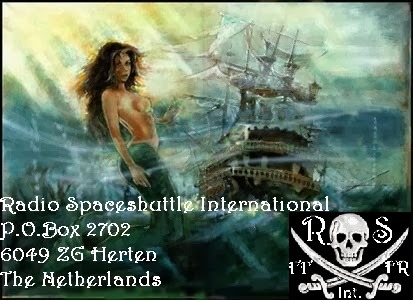 QSL received from Radio Etherfreak. In accompanying email, operator said he was using a homemade SW transmitter running about 40W. Antenna is an inverted V. He also has a website at www.etherfreak.nl. Thanks for the QSL. Santa's little helper has been working his way through the pile of QSL requests received for Radio Jingle Bells and I received this QSL for a Boxing Day broadcast. A very quick reply from medium wave station Radio Uniek which has many different and attractive eQSLs for listeners. Thanks for both these QSLs. 6205 0939 Radio King SW. Oldies, fair signal. SINPO 34333. 6220 1456 Radio Rode Adelaar. ID, polka. SINPO 54444. 6240 1445 Skyline Radio Germany. Pop, utility QRM. SINPO 23332. 6242 1617 Radio Twentana. "It's Raining Again," then Dutch song. SINPO 33333. 6268 1623 Radio Telstar. Relay of Artem's World Radio. SINPO 54444. 6271 1505 Radio Telstar. Move from 6273. SINPO 44433. 6273 1500 Radio Telstar. Polka, greetings. SINPO 44433. 6275 1711 Radio Tango Italia. ID jingle, tango mx. SINPO 44333. 6285 0923 Radio Telstar. Rock n roll. SINPO 44433. 6295 0928 Radio Edelkampioen & Sandor (via relay). Dutch mx. SINPO 34333. 6295 1613 Radio Tango Italia. Tango mx. SINPO 34333. 6303 1648 Radio Mustang. ID, OMD "Electricity," Ultravox "Vienna." SINPO 54444. 6305 1439 Radio Etherfreak. ID jingle, QSO Pluto, pop. Fair peaks. SINPO 24332. 6322 1427 NMD Radio. Country & Dutch mx. SINPO 34333. 6530 0910 Radio Bizon. Polka, Dutch song. SINPO 34333. 6747 1628 Radio Pioneer. ZZ Top "Legs." SINPO 34333. 6803 1515 Radio Pink Panther. "Something's Got A Hold on my Heart," SINPO 54444. 6815 1508 Sundown Radio. "Give Me the Night," ID jingle, "Just An Illusion." SINPO 44433. 6950 0915 Radio Coax. ID, email addresss, instr mx. SINPO 24332. 9908U 1008 Baltic Sea Radio. ID jingles/email address and off. SINPO 44433.